It's time for the weekly wordless Wednesday Whatchamacallit. Thank you Blog paws for letting my paws join in. I was trying to box the knuckles of the human man. He boxed me in. Meowrrrr. Boxes are the absolute best. Wishing you a happy, healthy, and fun 2016! Did you find yourself a good box, Shadow? The humans try to always keep a play box around. It keeps me out of trouble. This is a great photo! 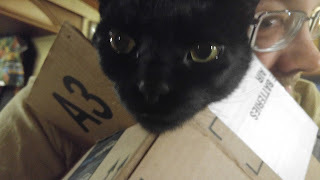 The boxes are the best part of gifts (at least that is what my cats tell me). It looks like you found a good one, Shadow! I hope you're not getting shipped back! Shadow, it definitely looks as if you're about to be mailed!! Look out, buddy! Glad you got back out on the water. Happy New Year!! Happy Wordless Wednesday, Shadow, and Happy New Year. Going on a long trip? Happy New Year! Boxes are always a happy place.